AppleInsider was given a first look at SimpliSafe's refreshed home security system, guided by founder and CEO Chad Laurans, as well as its outdoor security camera and video doorbell arriving later this year. Chad Laurans: Hi. I'm Chad Laurans, founder and CEO of SimpliSafe. Victor Marks: So tell me about why you founded SimpliSafe. CL: It was about 11 years ago, and what we saw at the time was that the existing industry just wasn't serving customers well enough, and it seemed like an industry in need of disruption. I had a couple friends who were actually burglarized and I had these conversations with them again and again about how they felt vulnerable and they wanted to do something about it. They wanted to get a security system, but none of them did. CL: They tried contacting some of the big existing security companies, and it just didn't work for them. It was expensive, it required a long term commitment, and it required a lot of hassle. They had to have someone come to their house, they had to set up appointments, they got strong-arm sales tactics, and so we started SimpliSafe to change all that. CL:Over the past ten years, we've grown into one of the largest home security companies, and the fastest growing, and what we do is we have put together a system that is incredibly easy to install yourself, and get real security. CL: Tomorrow, we're incredibly excited to announce the all-new SimpliSafe, which is the next generation of our home security platform. It's a very comprehensive platform. VM: How does it work with a smartphone like the iPhone. CL: We have an interactive app that allows you to help you install the system, use the system on a daily basis. You can use the app to arm and disarm your home security system, set a custom PIN, maybe you want to give a contractor a PIN for a few days to do some work on your home, then take the PIN away. 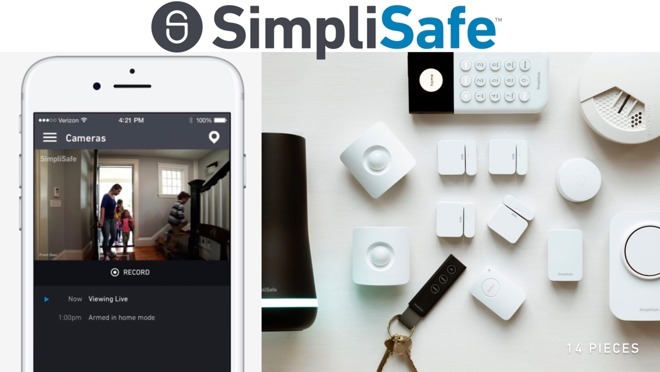 It lets you monitor the cameras in the SimpliSafe system, both live feed and recorded video, that can be motion around the camera or video that happened during an alarm event. If you want to review the footage to know if it was a false alarm or a real alarm where there's a burglar in your home. You can use your iPhone to check in on your home in any of these cases. VM: At AppleInsider, we're big fans of HomeKit. So, have you got the system working with HomeKit? What's the news here? CL: Yeah, we're excited to be adding all sorts of additional integrations with this next-generation system, so this will include integrations with folks like Apple's HomeKit, and we're excited to roll those out. We have a whole suite of them planned for this year as this year rolls along, and are excited to add that among them. CL: One of the key touch points of this system is our wireless keypad. This is completely wireless, battery powered. The batteries last for up to two years in this keypad, so you can install it right by your door where it should be, and never think about it again, other than as you're using the system. It is one of those components that's meant to be generally silent on your wall, not something you have to notice all the time, so it's got a kinda dead front look, but as you interact with the system, it has a touch-to-wake feature, so as you come up to it and start to use it, it'll wake up. CL: You can see the state of the system at any time, arm it into home mode or away mode, enter your PIN, and after you're done, it'll silently go back to sleep. The keys are all backlit and it has a soft-touch surface, using premium materials to make it fit well into your home. CL: This is our base station. This is the brains of the system. You could put this anywhere in your home. It has a built-in cellular connection, so that you can always be connected back to your alarm monitoring service. It also has a built-in Wi-Fi connection, so it uses those two connections redundantly. You don't have to think about any of that, it's gonna use them in parallel for you, without you having to configure anything. CL: And we've just turned the alarm system on. It has built-in voice prompts, so that it helps guide you both through the installation and use of the system, and as you can see that light ring around the bottom also gives you some intuitive indications about what the system is doing. When it's protecting you it's going to be lit up blue, when it's off it'll be turned off, and as you use the system it has animations also that show up when it's counting down or when it's installing a new sensor. CL: That component I would highlight is our door sensor. You can see up here on the door we've made them incredibly small so they can tuck anywhere into your home and to windows and doors. They're about a quarter of the size of our current generation sensor, and the battery life is just as long, if not longer, and the range, that wireless range, has been increased to over a thousand feet. CL: Behind you over here is the motion sensor. Again, tucks very quietly into your home. Again, that wireless range of over a thousand feet and long battery life. It's also been tuned to be resistant to any false alarms that could be caused by pets, we've tuned the motion detection algorithm to be even more pet friendly, so you can use it, you can put it up without thinking about it. CL: Behind you over there is our glass break sensor. It is designed to detect the unique acoustic signature of glass breaking. This next-generation sensor has a three-phase detection data model that we've used to, again, decrease any false alarm triggers like a plate clinking or a loud noise in your home, or a dog barking, and is gonna be tuned to detect the unique signature of glass breaking. CL: On the floor over here we have our water sensor. They will detect any water leaks, if you have a water heater that's going and it starts to leak, you'll want to know about that before the water's pouring out onto your floor. It can be great by plumbing, air conditioning units where the condenser may back up and overflow. We have all sorts of great success stories of water sensors detecting leaks early before it causes any damage in your home. Again, very long range, low cost, they're about $19 and you can sprinkle them throughout your home very easily and be protected from those kinds of water damage. VM: Flood, mold, that kind of problem? CL: Up here on the wall we have our 105 decibel siren. We like to call it the Burglar Blaster. If anyone is breaking into your home, this siren will sound, and it's incredibly loud and will let everyone know. It's also weatherized, fully weatherized, for indoor or outdoor use. CL: We have smoke and carbon monoxide detectors over there. Again those have long battery life, provide you with five years before you have to change batteries, and if there is anything going on with the detectors, the whole system will provide you with warnings. So you'll get a notice on your iPhone, for example, if the battery is running low, or even better, if somebody takes that detector off it's bracket. You'll get a notice. CL: Final components, right over there by the master bed, you'll see a panic button over on the wall. That component is a popular feature for folks who want to be able to immediately trigger an alarm. You can configure it to be a police dispatch, or fire, or a medical alert, so elderly customers might use this if they want to be able to trigger an ambulance response, for example. CL: This temperature sensor can be configured to trigger a freeze alert at any low temperature you want to set, and a high temperature alert, for example if you live in a hot climate and you want to know if your air conditioning has gone out and your pets might be subjected to too-high temperatures, or if you have a wine cellar and you want to protect the wine and make sure it's staying at the right temperature. CL:Some small business customers like to use it for protecting the meat locker, for example, if they've got thousands of dollars of inventory and if that refrigeration ever goes out, they're gonna lose all that inventory, they can configure an alert for that high temperature as well. CL: One of the great features about this indoor camera is that it has a built-in privacy shutter. You can see right now actually that that steel privacy shutter is now closed. This is really important for us as a security company, we want you to be able to put that camera wherever you want in your home and know that it's going to be your security camera, it's going to be private. When the alarm goes off, that shutter will open to record footage of the actual alarm event. When you leave your home and you press that away button on the keypad, it's going to open that shutter and make sure that it's monitoring anything that's going on while you're away. CL: But when you click home, all those steel privacy shutters are going to click closed, and you can know at a glance and you can hear that sound, and you can know that this is your private space in your home, and there's no possible way anybody will be looking in on you. CL: In addition to that existing camera, we will be launching in the coming quarter our video doorbell. This is a 1080p video doorbell that you can hook up right outside your door. It has motion detection, two-way audio, premium finishes with an aluminum button for the doorbell, and a light ring to indicate the state of the system. CL: We will also be announcing an outdoor battery powered camera, to be coming later in the year. It's designed to be installed anywhere on the outside of your home, it has a built-in floodlight so that it not only provides recording of the activity outside your home, but provides the security benefit of that motion activated light as well. CL: The final component we will be announcing is a smart lock, which will be integrated into the rest of the system, so that as you come and go, you can very easily arm your system, make sure all your locks are closed, disarm the system from a keyfob, unlock the doors, turn off the security system, and have that all nicely integrated together. CL: So we're excited to be announcing all of this, in addition to that whole core platform as we talked about, we're also excited to be announcing integrations with voice assistants and other smart home devices, so that whether it's our lock or perhaps somebody else's lock, it'll be a nicely integrated experience for you as you use your home security system. VM: Fantastic, well thank you so much Chad. CL: Yeah, it's been great talking to you. Thank you.